A Biblical reconsideration of the apparitions of the Virgin Mary. By Timothy Kauffman. "One day through the Rosary and Scapular I will save the world." Now it is time to see if they can withstand a test by fire. In Quite Contrary , Tim Kauffman details his former devotion to the apparitions of Mary and explains why he abandoned the use of these Marian articles. By considering the teachings and rituals of the many apparitions in the world, Kauffman explores — and ultimately rejects — their claims in light of the Bible. Quite Contrary is the story of a man who was lost in Marian devotion and then set free by the power of God's Word. 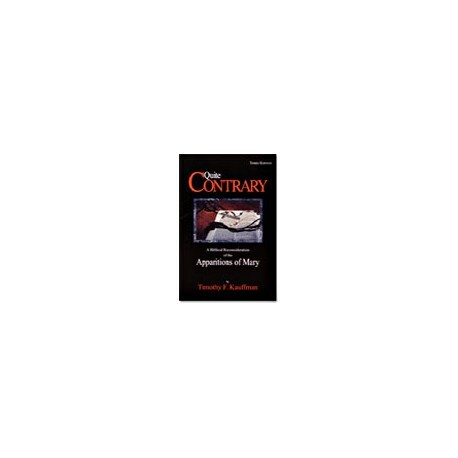 Quite Contrary is a Biblical reconsideration of the apparitions of Mary.